Easter will soon be upon us, and I am so looking forward to spending time in the Word and with my family over the Easter break! 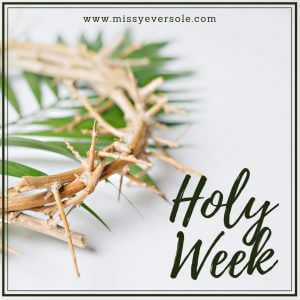 Beginning on this Sunday, Palm Sunday, we will start what is known as “Holy Week” or “Passion Week.” From the triumphant, prophesized entry of our Savior on a donkey, to His death and resurrection, and everything in between; Holy Week tends to get overlooked by the busyness of our lives. This Holy Week, let’s be committed to understanding what it is all about. Let’s take time out of our busy lives, to focus on the Savior and His undying love for us. Schedule a Time to Pray – I’ve written numerous times about how important prayer is in our lives. No matter what is going on in your life or how busy you are, please take the time to reflect, to praise and to confess your sins to God. Whether it’s early morning, at lunch, or after everyone goes to bed, make time for some one-on-one with the One who loves us. Read and Study the Word – Many study Bibles have a timeline of Holy Week. Read and study those scriptures slowly. Pray that the Lord will give you wisdom, understanding and that He may reveal Himself to you. Even though you may have read these scriptures over and over, I guarantee that the Lord will reveal something new to you! Attend Church Services – Many churches will start Holy Week with a sermon on Palm Sunday. Pray that the Lord gives your pastor the words that will bring glory to Him. Throughout the week, churches may offer a Maundy Thursday and Good Friday service. I encourage you to attend those and be blessed and humbled by the love that the Savior has for you! Beginning on Sunday through Easter, I will be posting a short devotion that will coincide with the happenings of each day of Holy Week. I would love for you to join me each day as we see the timeline of Jesus’s death and resurrection! 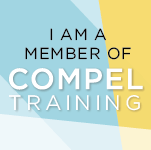 Will you join me this upcoming week? Will you be willing to set some time aside for the Word? 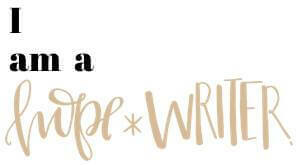 I am, and I pray that you will too! Thanks for this reminder to focus on him this week. He is waiting for us to carve time out for him. Blessings to you this week, Theresa!